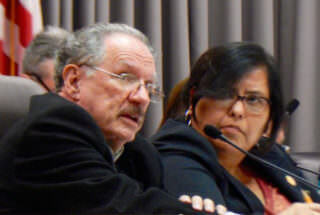 George McKenna and Mónica García. After passionate debate and pleas from charter school administrators and parents, the LA Unified school board voted 4-3 to support three teacher union-backed bills being considered by the California legislature that all restrict some of the autonomies given to public charter schools. The most contested bill, SB 808, was pulled by its author on Monday and put on a two-year timetable for further discussion. It seeks to prevent charter schools from being able to appeal local school district decisions to the county or state boards of education, and it allows a school district to deny a charter if it could be considered a financial hardship on the district. But despite the bill being tabled, the school board still voted Tuesday to support it with both words and money, directing Superintendent Michelle King to spend LA Unified’s “advocacy resources” lobbying for it. The lengthy debate brought into stark relief the political divisions on the board, as all four board members who supported SB 808 had been backed by teacher unions in their elections. Both United Teachers Los Angeles and the California Federation of Teachers are actively pushing SB 808, and UTLA’s president, Alex Caputo-Pearl, argued for it before the board Tuesday. The discussion also highlighted board members’ allegiances, as they spoke either in favor of the district — defending its finances and stability — or in favor of students and parents’ ability to choose the best schools for their children. The vote was 4-3 in favor of the district supporting the three state bills and lobbying for them. All four board members who voted for the resolution — McKenna, co-author Scott Schmerelson, Richard Vladovic and board President Steve Zimmer — have received teacher union support in their elections. Ratliff, who is leaving the board in June, voted against the proposition along with charter supporters Mónica García and Ref Rodriguez. “I do want to say for me the issue is around due process,” Rodriguez said. He pointed out that the bill is going to be discussed for the next two years in committee and could come out very differently. Tuesday’s vote came four weeks before the May 16 school board runoff, and board members noted that depending on the election’s outcome, next year’s board might have voted differently on the resolution. One of the candidates seeking to fill Ratliff’s seat, Kelly Gonez, who teaches at a charter middle school in South LA, said she would not have supported the resolution and she regretted the board’s vote. Nick Melvoin, Zimmer’s opponent in the District 4 runoff, called the resolution disappointing and said in an email it will further divide the community. Earlier this month EdVoice, an education advocacy nonprofit organization based in Sacramento, sent a letter to state Sen. Ben Allen (D-Santa Monica), who chairs the Senate Education Committee, “strongly” opposing SB 808. This article has been updated with CCSA’s statement.